Maximise the impact of your green investments and funding for sustainable development projects with more efficient transfers and fewer financial risks. New Disberse + AidHedge = True! AidHedge’s financial algorithms mean better transfers and less leakage on the way to where it’s needed. We makes sure transactions are made at the best rates with the lowest fees. Financial risk and uncertain budgets are costly. We identify and help manage financial risks in aid and sustainable development projects. Predictable funding leaves more time for you to focus on your mission and the results. Most aid and development organisations pay more than they should for transactions. We work to make sure transactions are made at the best rates with the lowest fees. Navigating donor requirements and national regulations is often a lot of work. We provide instant budgeting and financial reporting. Reduce your administrative costs while ensuring all requirements are met. Are you paying too much to send funds abroad? Sustainable development needs new approaches. Together with financial partners, we offer services tailored for the unique SDG context of working with donor funding, financial uncertainty, or in high-risk countries. Join us on our journey Stay updated on our work for better financial aid transactions. We document the journey in detail on Medium and love feedback, comments and discussions. Join us there, or on Twitter and LinkedIn as we break new ground. Disberse + AidHedge = True! 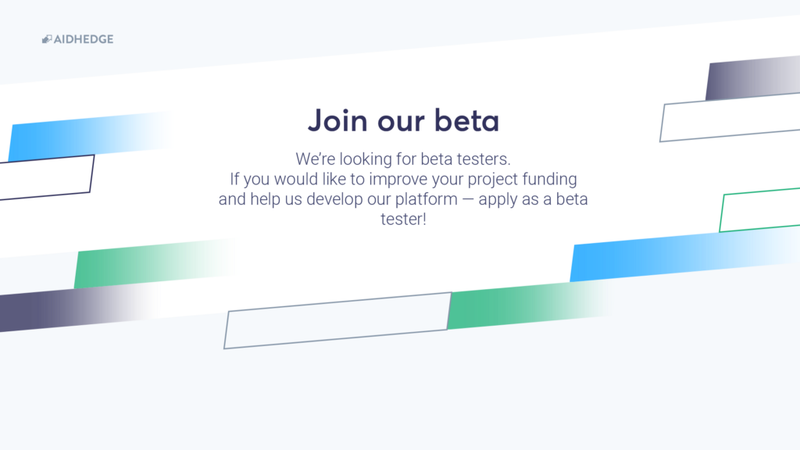 The first step towards better funding — join our new beta program!